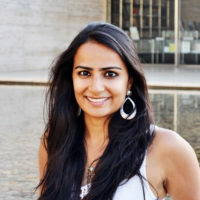 Ankita joined NACTO in 2015 and helped with the writing and production of the Global Street Design Guide. Her current work involves applying tools and strategies from the Global Street Design Guide to address street and public space design challenges, which cities around the world are currently facing. She has been managing NACTO-GDCI’s efforts to improve road safety in Sao Paulo since early 2016, and plays a support role for the team’s work in Mumbai. Prior to joining NACTO, Ankita worked as an Urban Designer for the planning studio at Skidmore, Owing and Merrill in San Francisco, where she primarily contributed towards mixed-use planning and transit-oriented urban projects. Her work experience varies greatly from detailed architectural design projects to large scale planning efforts throughout India, China, Malaysia, and the United States.